This object lesson teaches that God uses difficult times and circumstances to make us stronger. 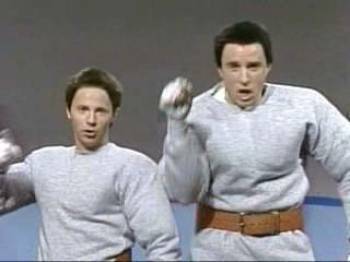 It’s a play off the Saturday Night Live skit on Hans and Franz, but the kids will not need to be familiar with the skit to enjoy the humor. It’s best if there are two leaders to do the lesson, but you can do it with just one. o Paint the two Styrofoam balls black. o Wrap the duct tape around the dowel rod from top to bottom so that it is completely covered. o Attach the two Styrofoam balls to either end of the dowel rod. · Put on the sweats, and stuff them with newspaper to make it look like you’ve got huge muscles all over your body. · Practice the script (and your Austrian accent). Franz: “See this barbell here?” (Point to barbell.